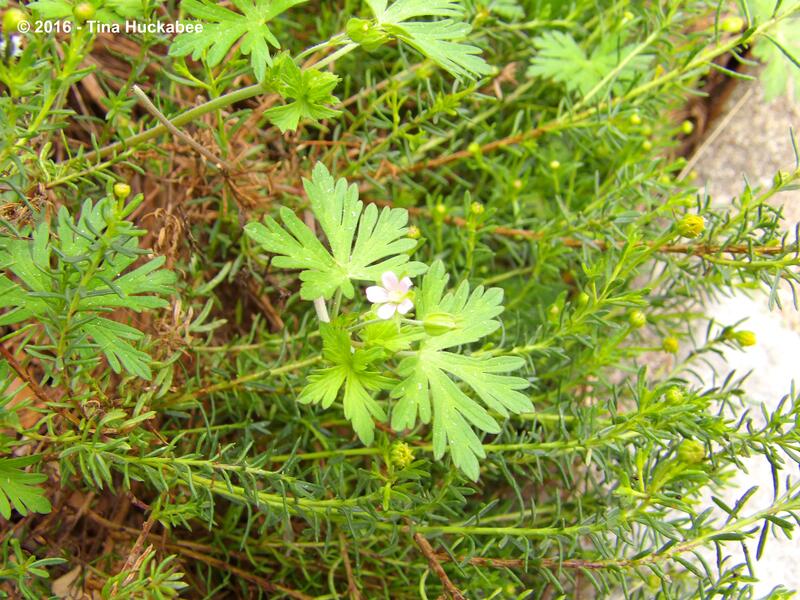 Carolina Geranium (Geranium carolinianum) and Damianita (Chrysactinia mexicana) pair well in a sunny bed. …the spring garden awakens the gardener’s heart and gladdens the soul. …or sometimes, a beloved daughter’s bicycle. 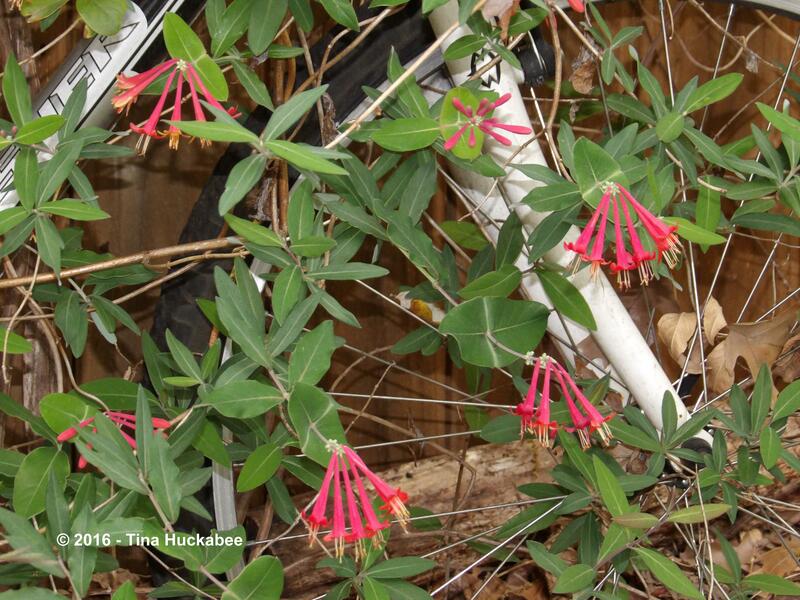 Coral Honeysuckle (Lonicera sempervirens) entwines and embraces Shoshana’s bicycle. 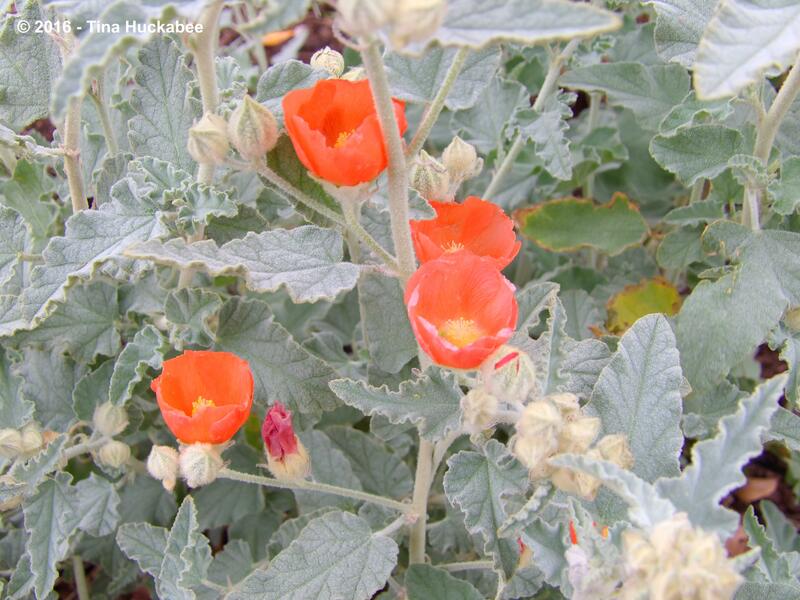 …while the orange-crush, cup-like blooms of Globe Mallow, Sphaeralcea ambigua, differentiate themselves from their companionable ruffly, silvery leaves. 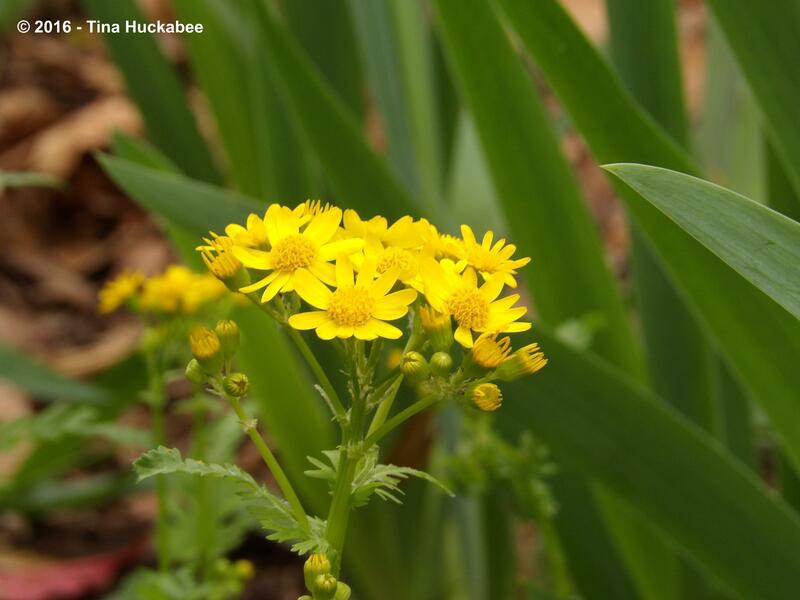 Sunshine yellow is plentiful at the terminal ends of stalks of Golden Groundsel, Packera obovata, . 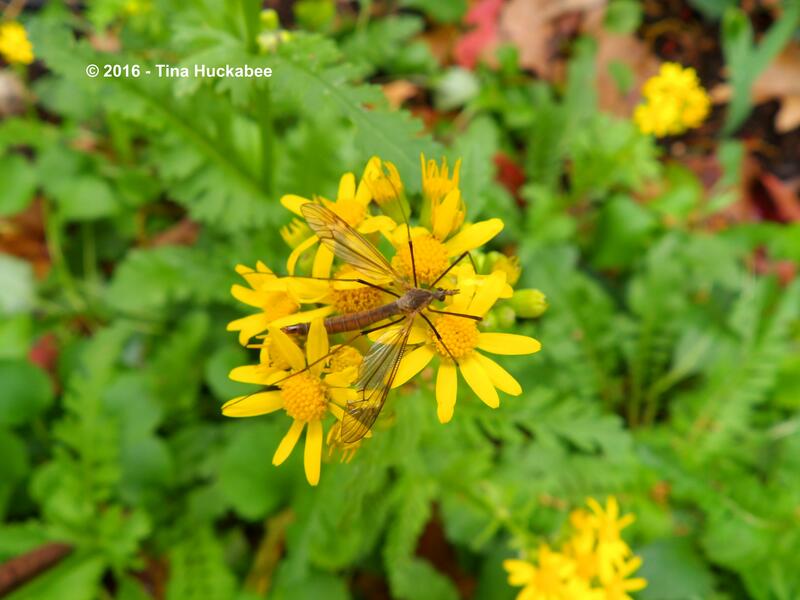 The cheery blooms give rest to a weary Crane fly. It’s easy to appreciate the many stunning blooms flourishing in the garden. …rush to compete with other plants, producing their own inflorescence show which has ramifications for all other parts of the garden. Fallen oak catkins cover a newly planted area. 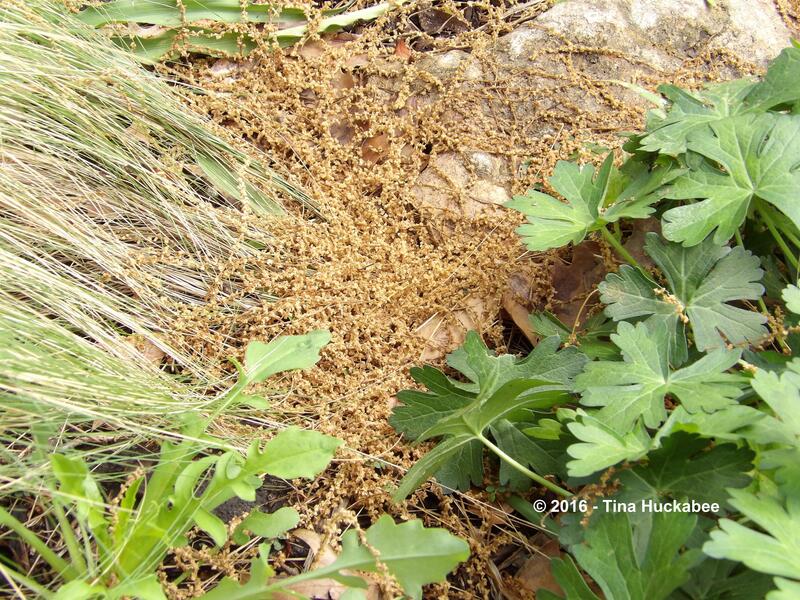 Oak catkins in between Mexican Feathergrass (Nassella tenuissima) and Winecup (Callirhoe involucrata). 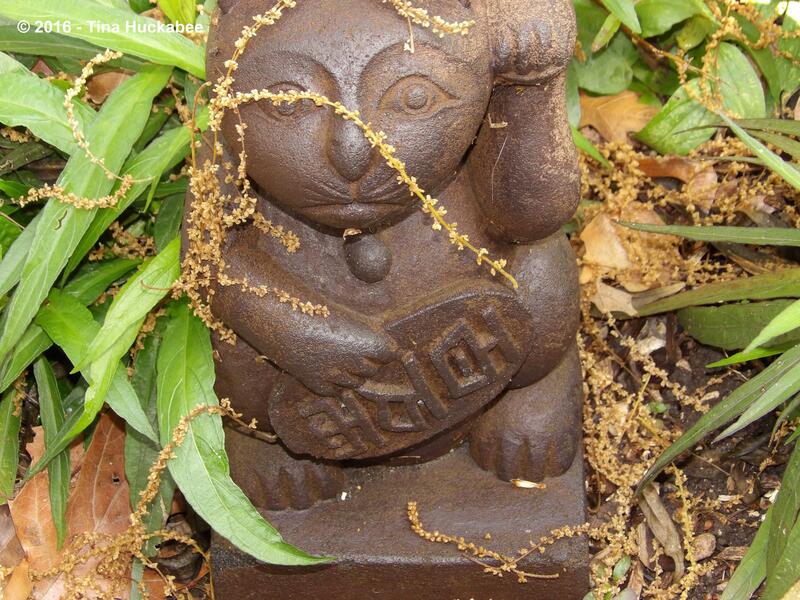 Catkins adorn a Maneki-neko garden art. 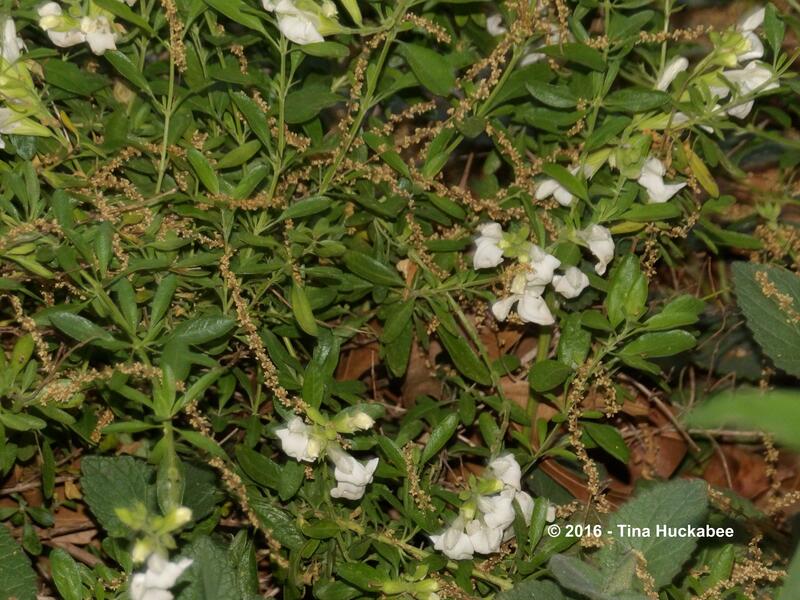 Catkins embellish a White Autumn Sage (Salvia greggii). Catkins float in the recently cleaned pond! Catkins drape over a Martha Gonzales Rose bush. Those darned catkins! They are not so easy to enjoy, nor are they so easy to clean up! Ah well, it’s all part of the spring garden experience. The early spring garden–easy to savor, easy to treasure. ….or to be charmed with the nighttime (and occasionally daytime) trills of the resident Eastern Screech Owl, Megascops asio, couple. Mama Screech Owl waiting for a snack from her mate. 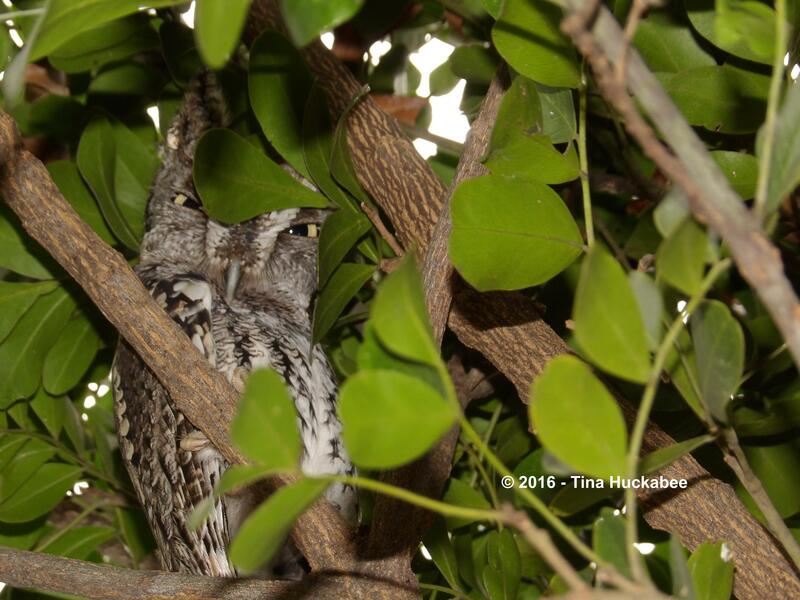 Daddy Screech Owl resting and watching in the Texas Mountain Laurel Tree. The spring garden is lush, colorful, vibrant–and ready for new life. 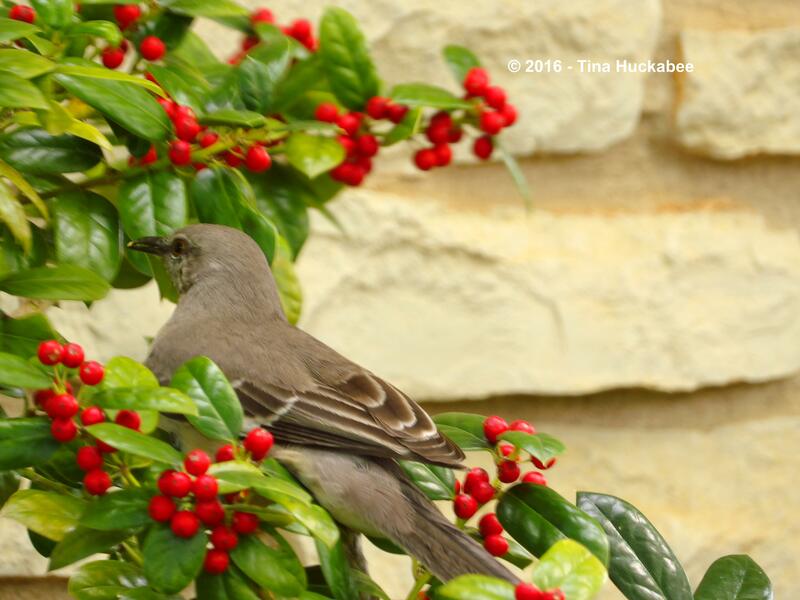 This entry was posted in Central Texas Spring, Native Plants, Spring Gardening, Uncategorized and tagged Biodiversity, Wildlife Gardening by Tina. Bookmark the permalink. I enjoyed seeing the wider view of your garden, it looks a lovely place to relax. It is a nice place, Christina, even in mid-hot-summer! I realize that I rarely post photos of the wider views and even more rarely, of my front garden. But I’m glad you enjoyed! It all looks wonderful. Love the globe mallow plant. Brilliant photos of the catkin debris, but I can see what you mean about being a menace to clean up! I am SO in love with that Globe Mallow and have such a hard time with it. I requires full, blasting sun and I have lots of part-shade. But there are a few spots and I’ve recently planted two more. Fingers crossed that they’re happy. 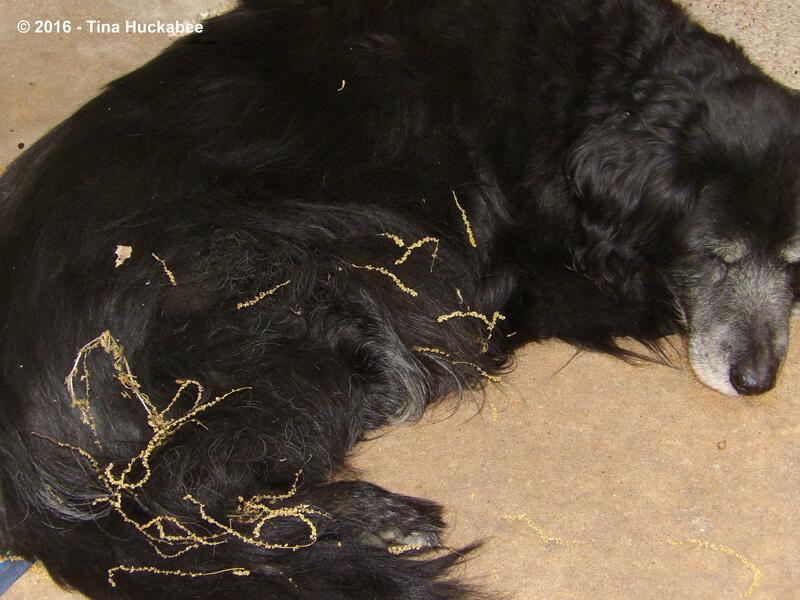 Yeah, those catkins are a real pain…. I feel impatient for this to happen here, you have so much in flower Tina and all looking lovely. There are only a few flowers about here, its still cold and very wet. Oh for a Spring day like yours right now! We had almost no winter this year, Julie, so things never really stopped blooming. There are plenty of herbaceous perennials that in a “normal” year, would only just be popping up from the ground, and yet this year, they’ve bloomed all winter. I’m not quite sure how I feel about that. Your spring is just around the corner and I’m sure it will be magnificent–just hold on a little longer! Your spring garden looks very different to mine, so many vibrant blooms. Here we are longing for a bit of warmth. 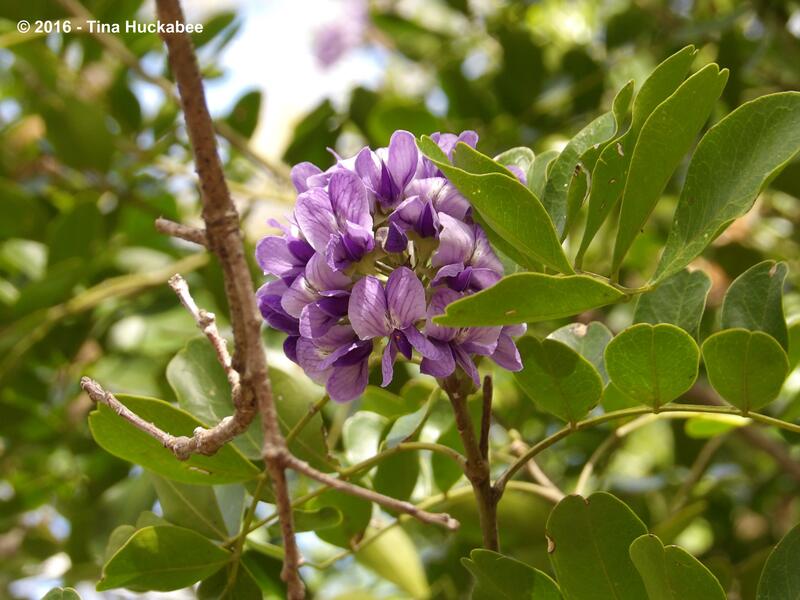 The violet Sophora is gorgeous, I’ ve never seen it before. I love your Maneki neko and the cute owl. I’ll be glad to send so some of our warmth! Isn’t the Mt. Laurel gorgeous. It’s in full bloom now, though this year isn’t quite as spectacular as last year was. 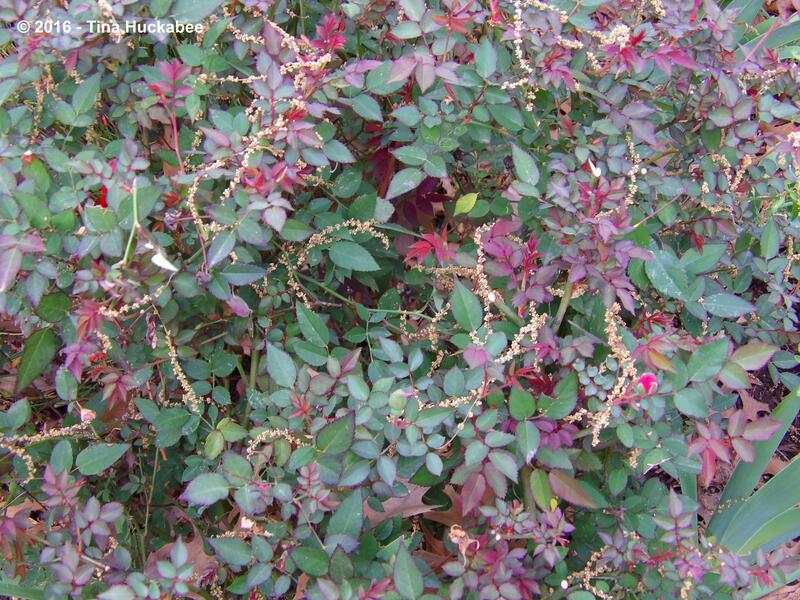 Still, the bees and butterflies love it and the blooms are famous for the “grape kool-aid” fragrance–very fragrant. Beautiful. 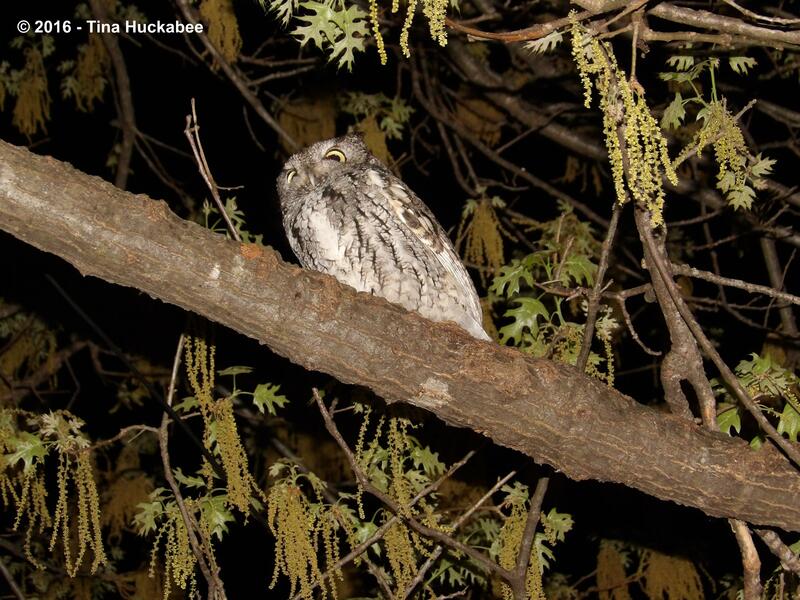 Resident screech owls must keep the garden lively. Yes, the other birds occasionally complain a bit, but I love my little owls. Mama has laid one egg, so far. Hope there’s more to come. 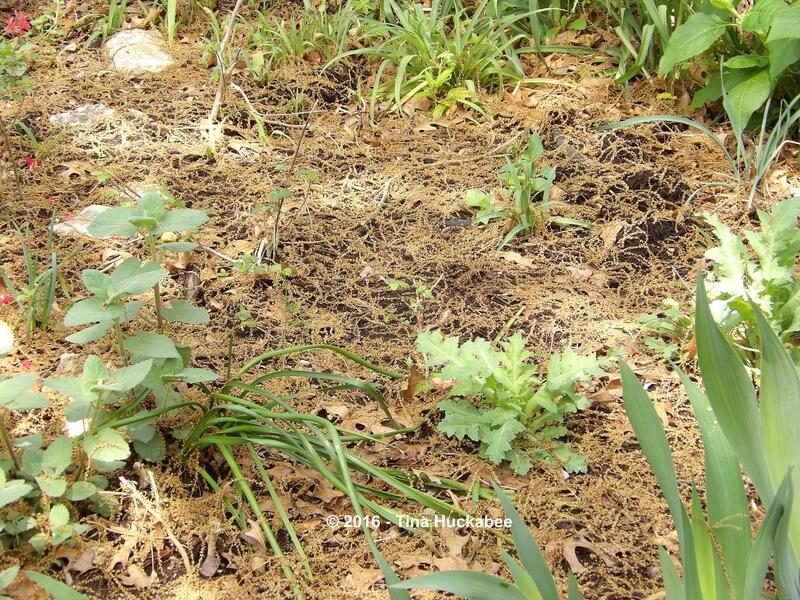 Your spring garden is really coming along. Are the Bluebonnets blooming out your way? Yes!! The Bluebonnets are hitting their stride right about now! They’re quite lovely along Austin roads and I’m sure the Hill Country will be flush with blue soon. Great. Heading west. I hope the rain was not too hard on them. So happy to see you still have a pair of little owls – seems I recall larger owls in the vicinity had potentially threatened their security. Your blooms are lovely as vignettes as is your garden taken more as a whole – so serene and peaceable. 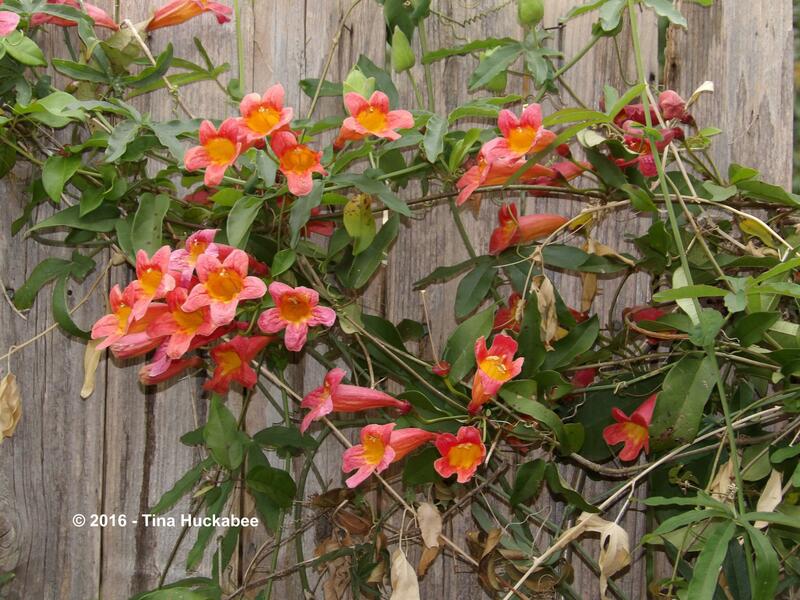 I appreciate how the Russellia equisetiformis flowers echo the red of your chairs while the oranges and purples of Laurel, Iris and Crossvine play all around them. Ha! 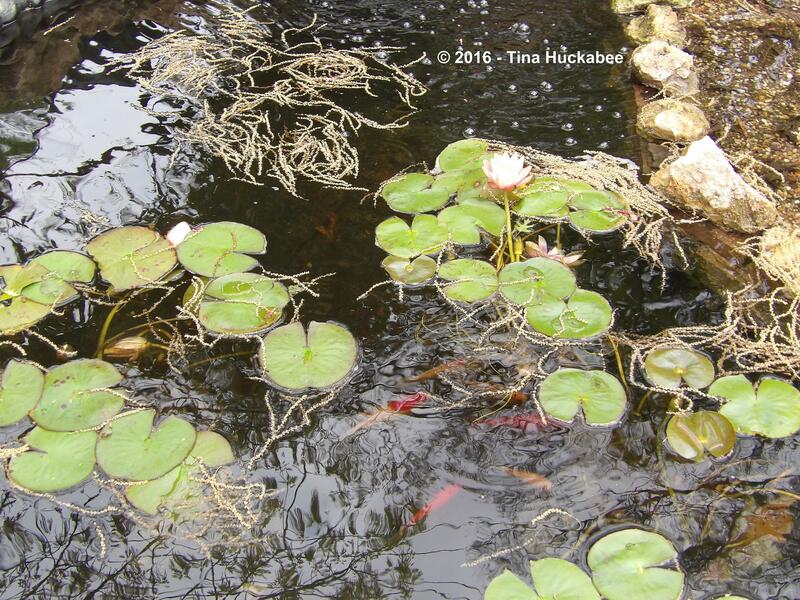 I bet cleaning the pond is like mopping or sweeping a floor. Having a cleaned expanse somehow seems to almost invite new debris. 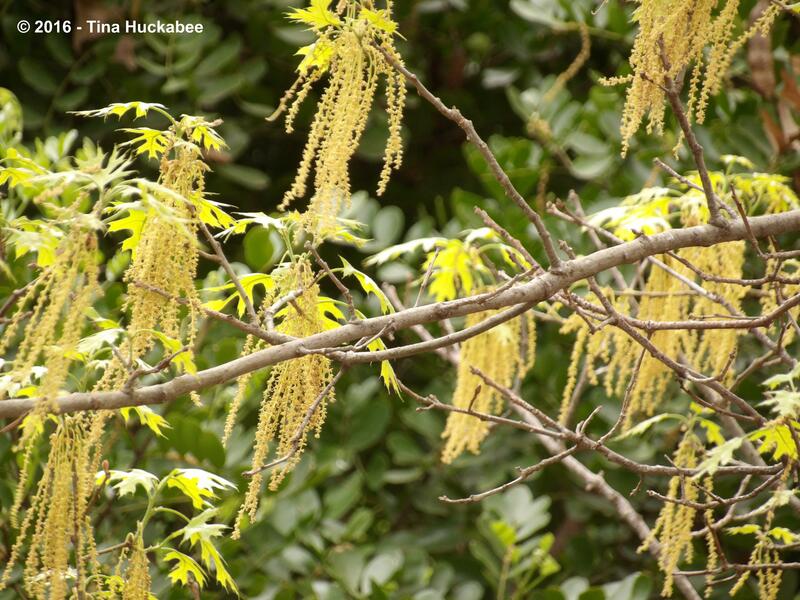 And…”inflorescence” is such a nice word for the oak’s mess! I don’t know if your fish appreciate whatever tiny creatures often take up residence in those catkins but I witnessed mockingbirds, blue jays and a male cardinal all hopping on the driveway this AM, flipping over wet leaves to gobble up …something!… underneath. Everybody seems happy-happy with Spring’s arrival this year! 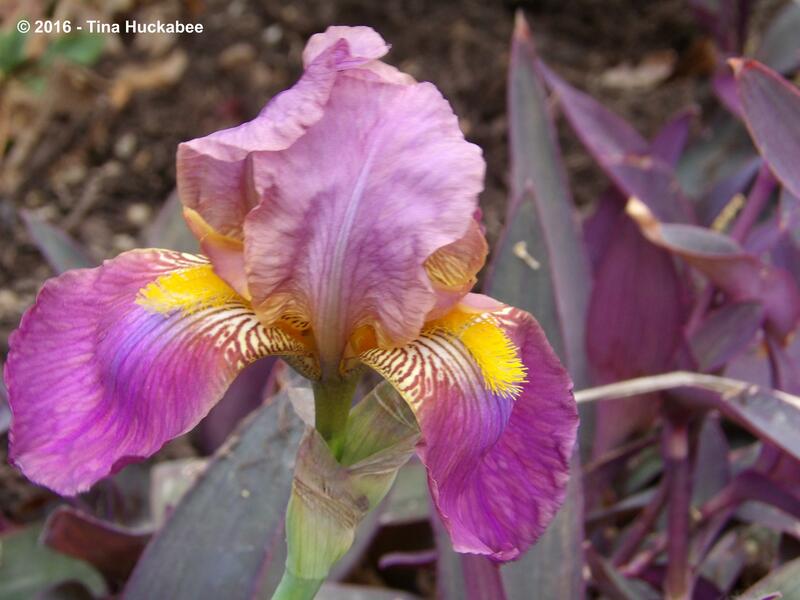 Anytime I can use the term “inflorescence” I do! 🙂 What’s always frustrating is that we clean our pond in February (usually), though this year a little later. The trees always drop that mess just after the pond is clean. I’m out there, with the fish net, sieving up goo and trying not to have any fish in the goo, for a week or so. Gah!! Anyhow, this too (goo!) shall pass. 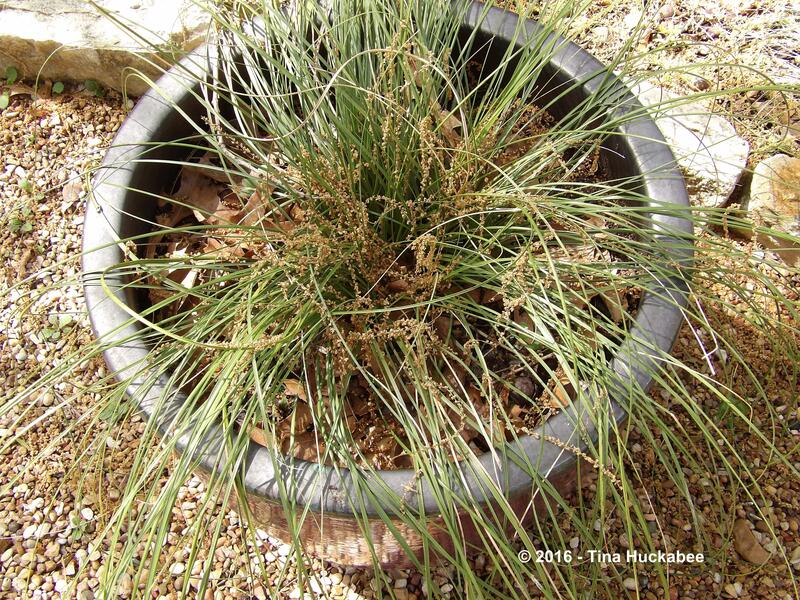 It was such a mild winter that the Russelia bloomed the whole time. I just adore that thing–such a trooper. Also, yes, there is a pair of Great Horned Owls and they’ll gobble Screeches if given a chance. I had a scare last weekend when I found a dead Screech in the road, just down the street from my house. He’d been hit by a car and I was concerned that he was the Daddy of my pair. He wasn’t (I’ve seen both of “mine”), but it’s a dangerous world out there for all wildlife. Lots of lovely plants in your garden and I also like the garden art statue. Thank you! I like that little cat! 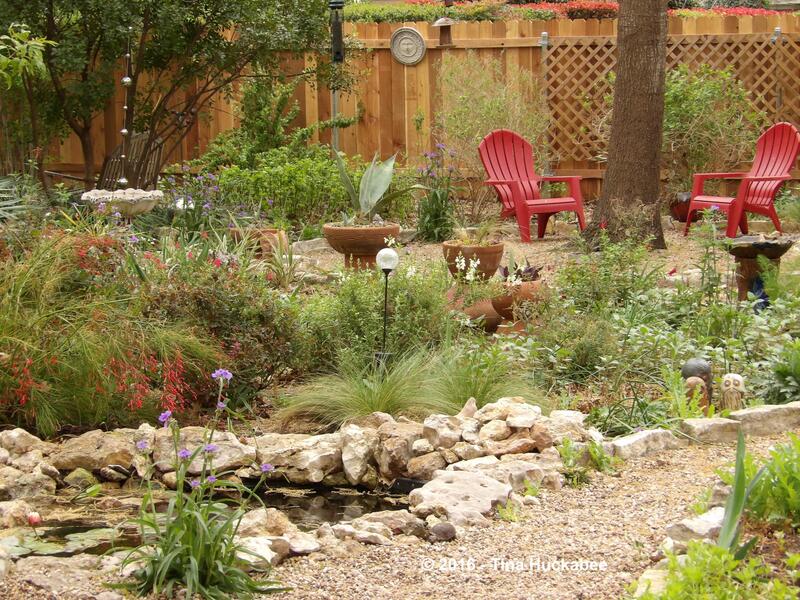 Your garden is a lovely retreat! 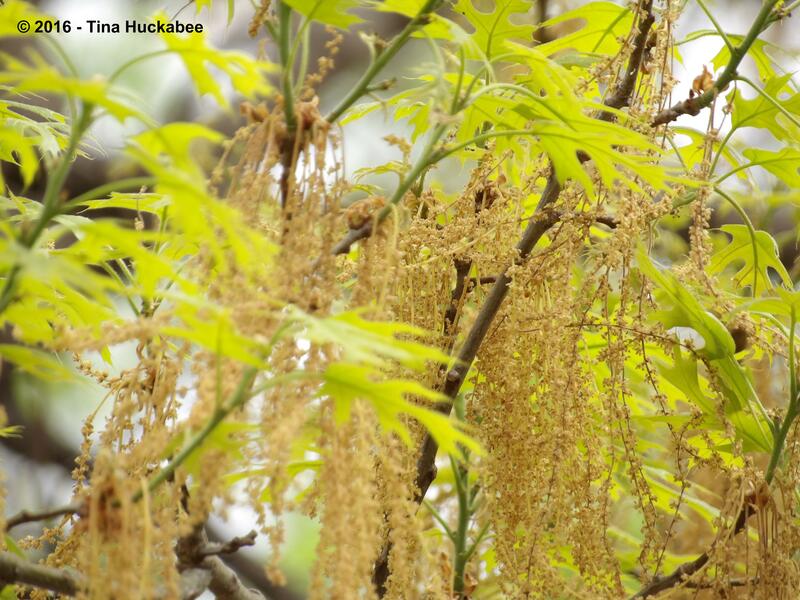 I dread the catkins and the falling leaves on our Live Oak trees, but it’s the price we have to pay for summer shade. You’re so right, Tracy. Remember: it’s just a few weeks of mess for beautiful shade when we need it the most. Lovely, but how great also to have got some shots of an owl! Such lovely wildlings you have! 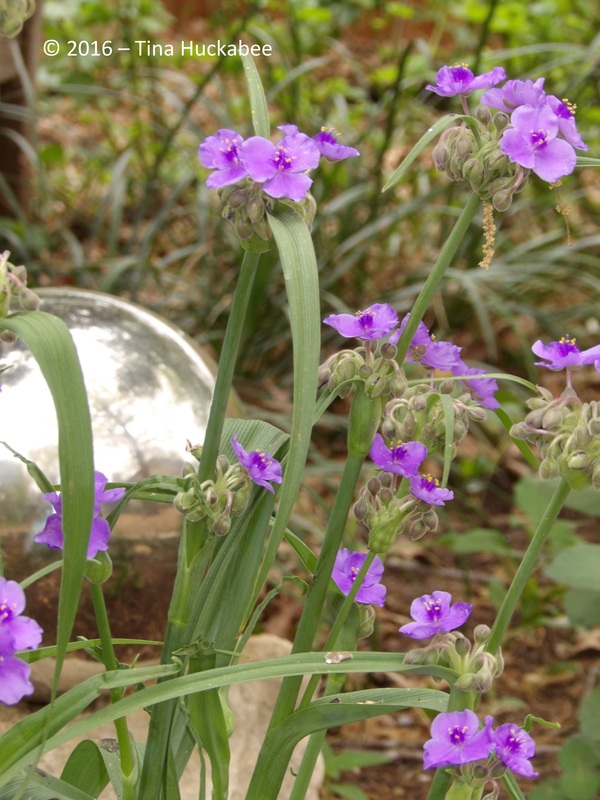 The Globe Mallow is a stunner, and I love the Texas Mountain Laurel. Both of those plants are real beauties–I wish I had room for more of each. What can I say, Jenn? I like red! 🙂 And your’re correct: Russelia equisetiformis, Firecracker Fern. Spring looks wonderful 🙂 We still have to wait a bit here but I thoroughly enjoy yours! Just hold on a little longer, spring is coming to a garden near you soon! Tina I couldn’t agree more…and this lovely post is perfect for my Seasonal Celebrations post…if you’d like me to include your post, let me know. Thank you, Donna and that would be just lovely–I’ll pop over now! I’ve been reluctant to add more memes to my blogging, because, well, it’s that much more. But I love the idea and appreciate your suggestion! our garden is definitely a spring garden, not up too much in the summer. lovely photos. Thanks–they were fun photos to take. There’s nothing like the garden in spring–and why not after winter? ❤ Asher. Such a good dog. And your owls. This is the first year that I can remember where the squirrels haven't nibbled on the growing tips of the Shumard. Normally I see them scattered all over the place. I think it has been such a mild winter that they haven't had to resort to such a famine food. Maybe? I love Asher too–catkins, fur balls, and all. Interesting about the squirrels and Shumards–my squirrels are munching on the new growth–I guess yours are more polite than mine.